Content: There’s a few f-bombs and some teen drinking at the beginning. And some intense kissing, not to mention violence. It’s in the Teen section (grades 9+) of the bookstore. Siblings Hazel and Benjamin have grown up in Fairfold, where they know that faeries are in the forest. 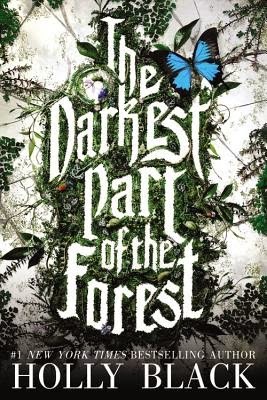 They know not to mess with the fairies, but since Ben was blessed (cursed) to make gorgeous music as a child and Hazel has always been drawn to the forest, they really didn’t listen. They made up stories about the prince that was in the glass coffin, they fought some bad faeries, and Hazel even made a bargain with the Alderking to help with Ben getting some musical training. But all that was in the past. Hazel, now 16, is reckless with boys’ hearts and Ben stopped making music years ago. And now the prince in the coffin is awake and Hazel’s life is falling apart. The question is whether or not Hazel can figure things out before her life is completely destroyed. I love Black’s storytelling. Wholly and completely. She pulls you into the world she creates, and makes you believe everything she writes. I loved Hazel in her brokenness, and her relationship with Ben. I loved that there were faerie characters and human characters in all shades of the rainbow (both in terms of skin color and morality). I loved the myth she spun around the town and these characters, and the way she worked with the whole idea of the fey. I just loved the book. Period.